While investors have been focused on the perennial failed hope for a second half economic recovery, they have been missing the most salient point: the U.S. most likely entered into a recession at the end of last quarter. That’s right, when adjusting nominal GDP growth for Core Consumer Price Inflation for the average of the past two-quarters the recession is already here. But before we look deeper into this, let’s first look at the following five charts that illustrate the economy has been steadily deteriorating for the past few years and that the pace of decline has recently picked up steam. There is no better indicator of global growth than copper. Affectionately referred to as “Dr. 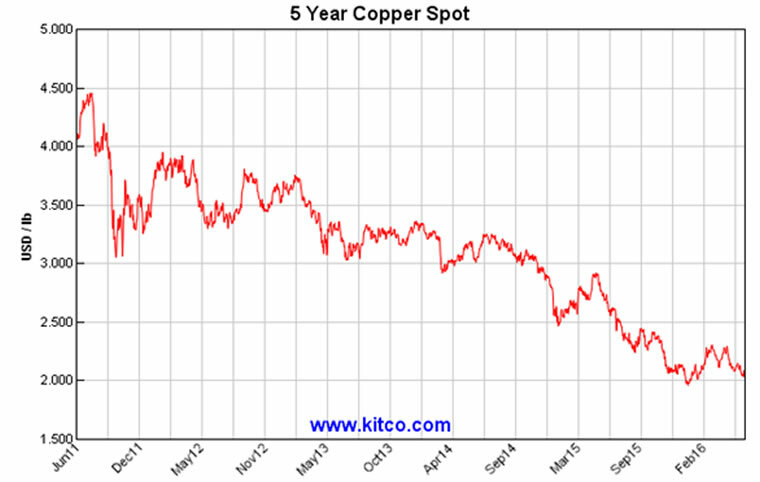 Copper”, this base metal has traditionally been a great barometer of economic health. Unfortunately, as you can see from the chart below, copper has been in a bear market for the past five years and shows no sign of a recovery from its 55% plunge. Next, we have the Baltic Dry Index. This index measures the demand to transport dry commodities overseas. An advancement of this index would represent an increase in global growth. But as you can see, this index has been in a down-trend since the end of 2013 and fallen 75% from that point. There is little debate that the worldwide economy is stagnating, and despite what some would like to argue, the United States has not been immune from this slowdown at all. To prove this we can first look at the spread between the Two and Ten-year Treasury Notes. When this spread is contracting there is increased pressure on banks’ profits, which leads to falling loan growth and less economic activity. The 2-10 Year yield spread has been narrowing since July 2015 and is now the tightest since November 2007. And the once crowned jewel of the post-Great Recession economy, the lagging economic indicator known as the Non-farm Payroll Report, is also rolling over fast. Last month’s disappointing 38k net new jobs created was written off by some as an anomaly, but the chart below shows that this was actually part of a declining trend that has been in place since October 2015. The falling copper price, tumbling global trade, a flattening yield curve, weakening industrial production and the rolling over of monthly job creation all point to an economy headed into contraction. But as mentioned earlier, to confirm that this recession may have already arrived, we need to look no further than the data published by the Bureau of Economic Analysis (BEA) and the Bureau of Labor Statistics (BLS). The official designator of a recession is the BEA, which defines the situation as two consecutive quarters of negative real GDP growth. During Q4 2015 and Q1 2016, real GDP posted 1.4 and 0.8% respectively—so officially we’re not in one yet. However, when deflating nominal GDP by the core rate of Consumer Price Inflation (CPI) published by the BLS, you get real GDP of just 0.3% in Q4, and negative 0.8% during Q1. Therefore, the economy is dangerously close to a contractionary phase; and is already in one when averaging the prior two quarters (at minus 0.25% when adjusted by core inflation). It took 1.5 years to bring the economy out of the Great Recession that began in December 2007. And it took a $3.7 trillion increase in the Fed’s balance sheet, plus 525 basis points of interest rates cuts to pull us out. The major problem is that stock market is now pricing in a strong recovery from the four quarters in a row that the S&P 500 has posted negative earnings growth. Another year, or more, of falling earnings for equities would result in a devastating bear market. The Fed already has a bloated balance sheet in relation to GDP and only a few basis points to reduce borrowing costs before short-term rates hit zero percent. Therefore, there just isn’t much the Fed can do this time around. Therefore, this next recession could last even longer than the previous one. The stock market is pricing in perfection and is ill prepared for a protracted recession that may already be underway. Prudent investors should hedge their portfolios now from such an unwelcomed event.